Training videos and workbooks for technical writers in the hi-tech industry. beginners, understanding complex software and writing marketing materials. No budget for training? No time to travel? You can still tackle your writing assignments with more confidence than ever... with the help of a workbook from Gordon & Gordon. For more information about a specific workbook or to order, click any of the covers on the right. Each workbook contains all the slides, exercizes and background material distributed at our workshops. And for even more information and interaction, check out our new "Workshops-on-a-DVD". It's just like being there! What's more, our money-back guarantee means there's no risk for you! So don't delay... order today! Our workbooks are full of concise, practical explanations for how to work effectively in the real world. We cover how to approach your writing projects... what to include in your documents and why... proven techniques for getting better results in the same time you're putting in now. You can't find this information anywhere else. Not on the Web. Not in some generic textbook on writing or programming or marketing. And certainly not in any book written for "Dummies" or "Complete Idiots"?! Since 1998 Gordon & Gordon have given workshops to audiences at home and abroad. Each page of every workbook is a PowerPoint slide theye've presented and refined based on feedback from hundreds of participants. 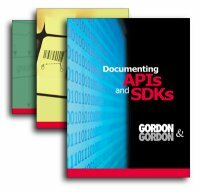 "Just wanted to say thanks for the excellent intro to API/SDK documentation via your workbook..."
"Inspiring... makes me want to get to work!" "My manager requested that I pull together a plan for reference documentation of several new products written in Java and C++. Your workbook helped me outline each of the guides and understand how to approach documenting the functions and objects... your book certainly helped!" "The right stuff... worth what I paid... a handy reference book when I need it." "I'll admit I was skeptical when I saw the workbook was a printout of Powerpoint slides from your course, but the material turned out to be solid and useful... Thanks again." In-house staff and independent contractors... beginners and seasoned pros... writers working everywhere from brand-new startups to the biggest names in high-tech. We've had orders from Australia, Germany, Gibraltar, India, Israel, New Zealand, Singapore, Switzerland, the UK and all across the US and Canada. We can ship anywhere. This website best viewed in 1024x768 or higher. Entire contents © 2004-2009 by Marc Proulx except for portions which are © 1999-2009 by Manuel Gordon & Gordon Graham and are used with permission. and be notified of fresh content on this website.